zarinahtakesapaycut: Part 2: MD of PwC Malaysia knowingly signed a false declaration: Here's the proof! 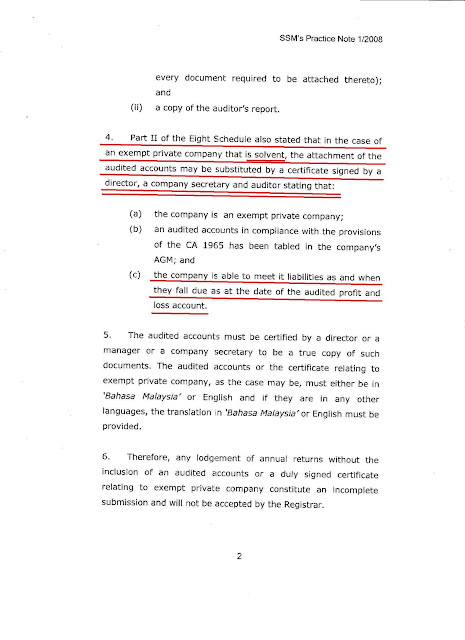 Part 2: MD of PwC Malaysia knowingly signed a false declaration: Here's the proof! Here we will show with the relevant documents, how the MD of PwC Malaysia, Mr Chin Kwai Fatt knowingly signed a false declaration with regards to the firm known as PricewaterhouseCoopers Consulting Sdn Bhd (464379-U). 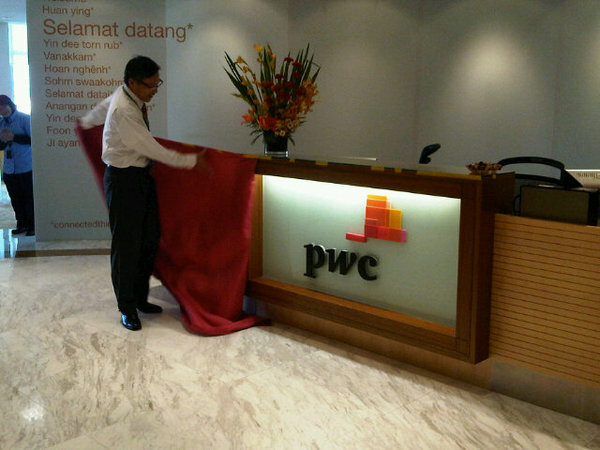 The MD of PwC Malaysia, Chin Kwai Fatt, launching the new PwC logo. This is a totally legal and harmless act. 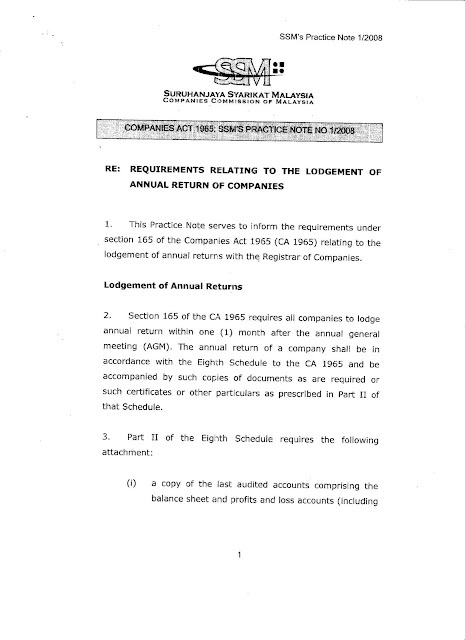 In Part 1, we showed how Chin Kwai Fatt, had signed the annual return for PricewaterhouseCoopers Consulting Sdn Bhd (464379-U) for the year 2008, in which it was stated, "as at the date to which the income statement has been made up the company appeared to have been able to meet its liabilities as and when they fall due." Chin Kwai Fatt signs off without disclosing the contingent liabilities, or ensuring that the company meets the required solvency tests to meet the contingent liabilities if they fall due. Chin Kwai Fatt signed this without disclosing the contingent liabilities arising from several lawsuits against PricewaterhouseCoopers Consulting Sdn Bhd (464379-U), which the company had not applied to strike out, making the possibility of the contingent liabilities amounting to several hundred million Ringgit becoming liabilities in the future events that cannot be termed as remote! In 2009, PricewaterhouseCoopers Consulting Sdn Bhd (464379-U) ceased operations, making it unable to meet the cash flow solvency test as there can be no cash flow when the enterprise ceases operations. The company also does not meet the balance sheet solvency test as the amount of assets it holds is a tiny fraction of the amount of contingent liabilities it has. PricewaterhouseCoopers Consulting Sdn Bhd (464379-U ceased operations in 2009, giving it no further cash flow, and insufficient assets to meet its contingent liabilities. 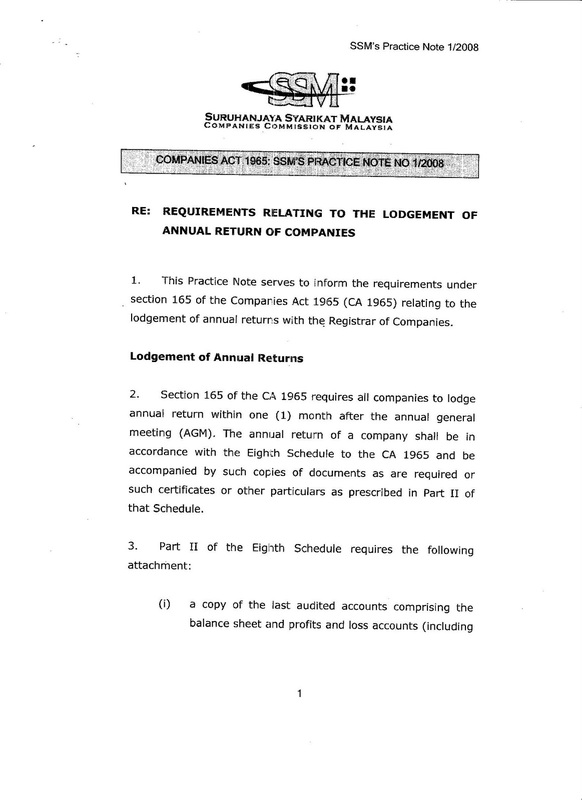 What does the Suruhanjaya Syarikat Malaysia have to say regarding the requirements relating to the lodgement of annual returns by companies? 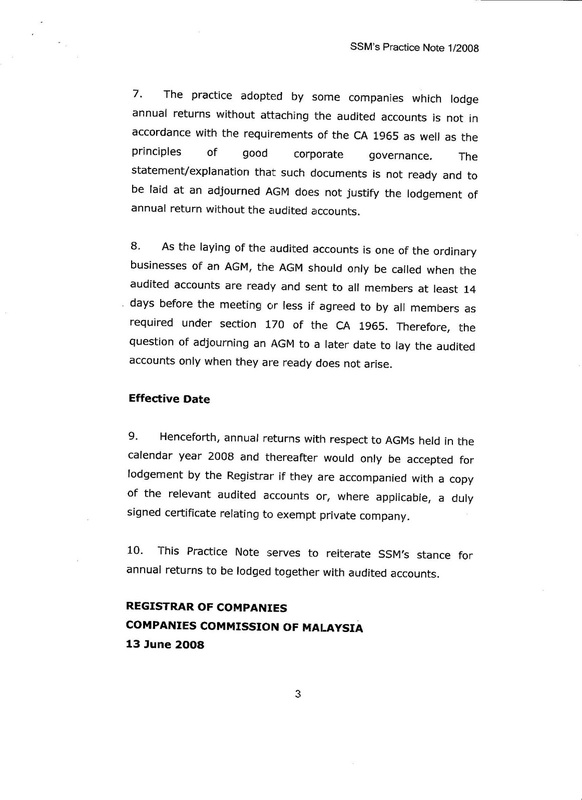 PricewaterhouseCoopers Consulting Sdn Bhd (464379-U) did not comply with the parts underlined in red for the year 2009. In part 1, the documents attached show that PricewaterhouseCoopers Consulting Sdn Bhd (464379-U) did not comply with Part II of the Eighth Schedule under the SSM practice note 2008, as highlighted above. So not only does Chin Kwai Fatt not disclose the contingent liabilities held by PricewaterhouseCoopers Consulting Sdn Bhd (464379-U), as well as show that the company passes the necessary solvency tests to meet these liabilities as and when they fall due, even though he signed off to that in the returns for 2008, making that a false declaration, PricewaterhouseCoopers Consulting Sdn Bhd (464379-U) also does not meet the requirements under the SSM practice note for the year 2009. Ever since the year 2002, the way Chin Kwai Fatt & Co have handled the affairs relating to PricewaterhouseCoopers Consulting Sdn Bhd (464379-U) has been a mockery of good corporate governance and business ethics. But to make a false declaration as to the real state of its annual returns is taking matters to an entirely new level of deception.